During the summer, attention turns to air quality all over the western United States, as smoke from hot forest fires fills our valleys. Most of the smoke is made of small particulates that are not known to damage plants. At about the same time, however, ozone can rise to damaging levels during the heat of summer. Ozone in the upper atmosphere protects us from the damaging radiation of sunlight. It can also be used to sanitize irrigation water. But at certain concentrations for certain periods of time, it can injure sensitive plants. Ground-level ozone is called smog. Smog-forming pollutants are primarily generated by internal combustion engines, not smoke from forest fires. Traffic and activities in urban areas generate the most pollutants, but often the wind blows the pollution to outlying suburban and rural communities. Emissions of hydrocarbons and oxides of nitrogen in the morning combine with summer heat and intense sunlight in the afternoon to produce ground-level ozone. Smog is a problem for the greater Portland and Medford, Oregon metropolitan areas during the summer months. It is created most often on days when the temperature is 90 F or higher, especially when winds are light or non-existent. All areas of Oregon currently meet the federal air quality standard for ozone. These levels, however, are based on human health. Sensitive plants can have problems when the ozone concentration is between 50–120 parts per billion (ppb) for extended time periods. The ozone monitoring station in Eugene, Oregon recorded at least seven days during the summer of 2017 that met this requirement. Ozone levels in the Puget Sound basin have exceeded the National Ambient Air Quality Standard (NAAQS) on several occasions in the last century. Sensitive plants are at risk if they’re grown near Seattle and Tacoma, Washington; Portland, Oregon; Vancouver, British Columbia; or any growing metropolitan area. What are the most sensitive plants? The list of sensitive plants is long, but it includes alder, begonia, blackberry, currant, dahlia, fuchsia, grape, lilac, milkweed, ninebark, Oregon ash, Oregon oak, petunia, poplar (including aspen), radish, sequoia, snowberry, sycamore, tomato, and tulip tree. There can be wide differences in tolerance within a group or species where certain cultivars are more sensitive than others. Symptoms of ozone injury on plants usually occur between the veins on the upper leaf surface of older and middle-aged leaves, but may also involve both leaf surfaces for some species. The cells of the palisade parenchyma of the most recently expanded leaves are the most sensitive to ozone injury. Tissue along the major veins usually remains unaffected. For dicots exposed to high concentrations of ozone, symptoms may include bleaching, flecking, stippling, and interveinal necrosis. Less severe symptoms can include bronzing, chlorosis and premature senescence of various plant parts. Monocots may show chlorotic or white white-to- tan necrotic lesions or necrosis of the margin and tip of the leaf blade. Less severe symptoms can also include chlorosis and premature senescence. Severe conifer symptoms include needle banding where clear bands of chlorotic tissue develop, as well as needle tipburn. Less severe conifer symptoms include flecking of older needles, mottling of younger needles, and premature needlecast. Many forest and landscape trees are susceptible to ozone injury. Extensive injury was detected on forest ozone biomonitoring sites in California, with ponderosa and Jeffrey pines, mugwort, skunkbush, and blue elderberry showing injury. 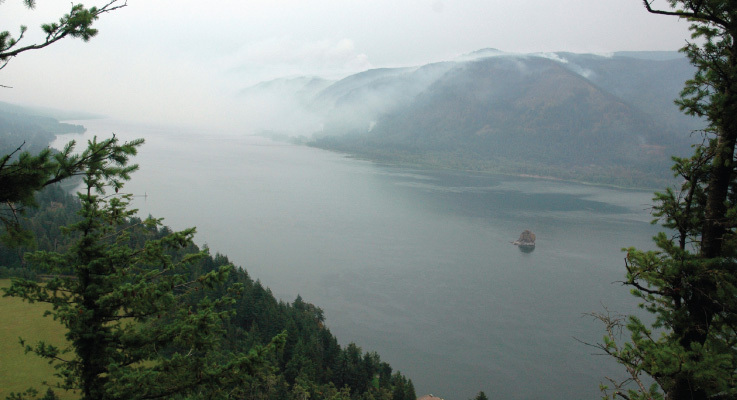 Little or no injury was detected in Oregon and Washington forest sites. 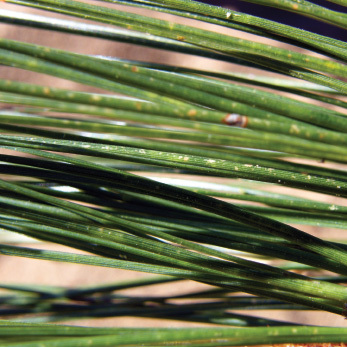 Symptoms of ozone injury on ponderosa pine include a chlorotic needle mottle, which develops from the tip to the base on older needles. These symptoms are followed by a necrotic tip dieback. The oldest needles become senescent and turn a uniform tan color. Normal needle retention is for 3–5 years, but ozone-affected needles are cast prematurely leaving the chlorotic mottled one-year-old needles on the tree. Eastern white pine is also sensitive. Symptoms start with minute, silver flecks radiating from the stomata of current-year needles. These tiny flecks develop into larger chlorotic flecks. These may develop into pink-to-red lesions and bands that spread to the needle tips. Normal needle retention is for three years but the resulting needlecast leaves only current season needles. Sensitive rhododendrons and azaleas show reddish brown stippling on the upper leaf surfaces and an overall general reduction in plant size. ‘Nova Zemla’ is a sensitive rhododendron while ‘Delaware Valley White’, ‘Roadrunner’, and ‘White Water’ are sensitive azaleas. In grapes, the damage is referred to as “oxidant stipple” or “ozone stipple” and has been observed in Oregon. Symptoms of ozone damage appear predominantly on older grape leaves. Small interveinal spots, 0.1–0.5 mm in diameter, occur only on the upper leaf surface. 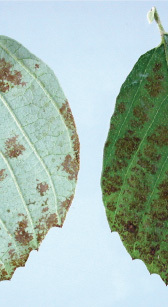 The lower leaf surface does not show stipple symptoms, but may show necrotic spots if symptoms are severe. Stipple may begin as a yellow color but is most commonly recognized when spots become brownish bronze to dark brown. Heavily stippled leaves may have a uniform bronze appearance from a distance and necrotic spots up to 2mm in diameter. The tissue in the veins surrounding lesions remains green. Affected leaves eventually drop from the vine. Growers may confuse this with spray damage. The most common symptom of ozone damage on field-grown beans is bronzing, in which a purple-brown discoloration that develops on the upper surface of the leaves. Bronzing on green beans has been observed in Oregon that could be due to ozone. 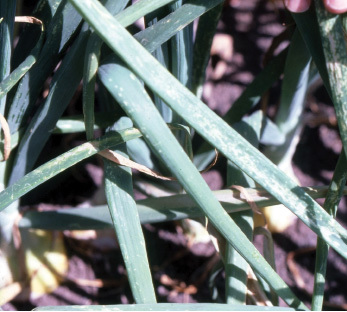 The symptom was observed late in the season and could easily be overlooked since crops are senescing or have other diseases (such as powdery mildew). Symptoms of air pollution and ozone injury have been observed in multiple bean fields in central Washington, particularly in adzuki bean crops. Ozone injury has not been observed on small fruit crops in the Pacific Northwest. Another common pollutant that forms from the incomplete combustion of fossil fuels is ethylene. This can be a problem for greenhouses and shipping containers where heaters are not properly vented. It also occurs when exhaust from vehicles idling outside a greenhouse drifts into plant production areas. Premature loss of flowers, epinasty, yellowing and abscission of foliage are common symptoms. To conclude, if you are near or downwind of a metropolitan area, air pollution might be the cause of mysterious leaf problems that show up just after hot summer days.